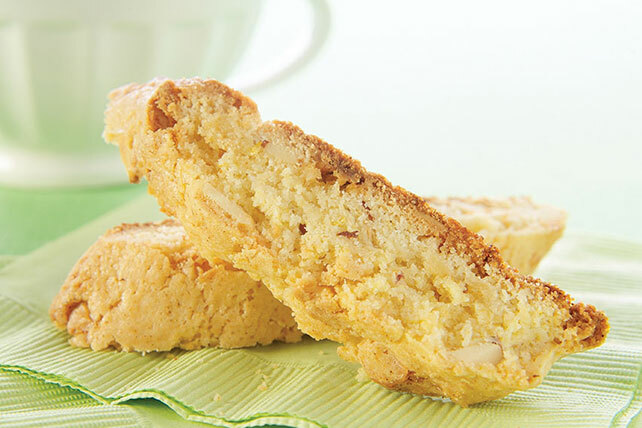 White chocolate and lemon zest give these crunchy toasted almond biscotti their sweet and citrusy appeal. Sift together flour, baking powder and salt; set aside. Beat butter, sugar and lemon zest in separate large bowl with mixer until well blended. Add eggs, 1 at a time, beating well after each. Blend in extract. Gradually beat in flour mixture. Stir in chocolate and nuts. Divide dough in half; shape each half into 12x1-inch log on floured surface. Place on greased baking sheet. Bake 35 min. or until golden brown. Cool on baking sheet 10 min. Transfer to cutting board. Cut each log diagonally into 21 slices, using serrated knife. Return, cut-sides down, to baking sheet. Bake 5 min. or until crisp. Remove to wire racks; cool completely. Heat oven to 350°F. Spread nuts in single layer on baking sheet. Bake 5 to 7 min. or until lightly toasted.